If the phrase “male a cappella group” conjures up an image of students singing traditional college songs… think again. Straight No Chaser (SNC) has emerged as a phenomenon with a massive fanbase, numerous national television appearances, and proven success with CD releases. Straight No Chaser has had an amazing decade. Ten years after turning a collegiate hobby into a recording career, their adventure has taken them around the world on tour. The a cappella group tells its story through music on ONE SHOT. Their seventh LP features 16 genre-spanning songs, and 10 entertaining conversational interludes, as the members of Straight No Chaser trace their unlikely rise from an undergraduate singing group at Indiana University to a beloved Atlantic Records act with a devoted international fanbase. Along the way, Straight No Chaser has sold more than 1.6 million albums in the U.S. and amassed more than 100 million YouTube views thanks to tightly arranged songs, impeccable vocal harmonies, and a healthy sense of humor. 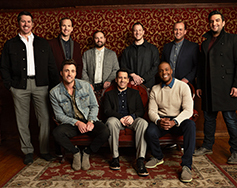 Yet Straight No Chaser’s success was never a given—these singers have worked hard to make the most of an unexpected opportunity when they signed with Atlantic and released their first album, HOLIDAY SPIRITS, in 2008. Recorded mostly in Bloomington, Indiana, with producer Steve Lunt, the track list for ONE SHOT reflects that sense of now or never, starting with opener and first single “Motownphilly/This Is How We Do It,” an energetic mash-up of Boyz II Men and Montell Jordan. Straight No Chaser made Jordan’s “This Is How We Do It” a staple of its repertoire in collage. Adding “Motownphilly,” with its lyrics about chasing improbable success, captured the way the singers felt as undergrads. “The lyrics from the Boyz II Men song fit our experience: We dreamed about this and now we are doing it, performing all over the world,” says Randy Stine, an original member. Far from sinking, the group has only picked up speed on the way to making ONE SHOT. “Every year it gets better and better,” says Tyler Trepp. “We keep surprising ourselves in a good way, and it just keeps growing.” Along with Stine and Trepp, the current lineup features Walter Chase, Jerome Collins, Seggie Isho, Michael Luginbill, Charlie Mechling, Steve Morgan, and David Roberts. They all have a hand in choosing songs, which mirror the singers’ widespread musical tastes, ranging from R&B and old-school funk to folk and classic rock. In addition to “Motownphilly/This Is How We Do It,” the group tackles Ricky Martin’s “Livin La Vida Loca,” Fleetwood Mac’s “Go Your Own Way,” James Brown’s “Papa’s Got a Brand New Bag,” and Percy Sledge’s “When a Man Loves a Woman,” a soulful ode to the singers’ significant others.